Dungeon crawler games have been around for a long, long time. I have spent days, maybe weeks of my teen years playing Hero Quest, released 1991. Before that I have played 1986’s Warlock of Firetop Mountain. And there are many others. They all share a basic formula: a group of heroes moves from one room to the other, rolls dice to fight monsters and either buys or loots items to make their monster smashing more efficient. Dungeon Fighter knows better than to mess with that basic formula. But Dungeon Fighter also knows better than to use that formula because, lets be honest here, it’s been done to death and depending on pure luck to smash monster’s faces in was never such a great idea in the first place. The genre needed a new twist, and it received one. The first thing you notice when reading the rulebook is that the designers didn’t intend to make a serious game, the introduction story is a parody on dungeon crawler games: the King was fed up with all those hero wannabes roaming his realm, taking money from his subjects and then disappearing without vanquishing any dragons or rescuing at least one virgin. So he had all those charlatans rounded up and thrown into the deepest, darkest dungeons of his kingdom, with only two options: emerge victoriously or become hummus for the local plant life. The manual puts it better than I ever could: “So, for you this means fight or … fertilise”. Dungeon Fighter doesn’t get any more serious than that. The second thing you notice about the game is that the dungeon is just a tiny floor plan with a marker on the room your party is currently being slaughtered in. The majority of the table is taken by a giant target, bigger than your average dart board. This is where you fight monsters. The combat mechanic is still dice rolling, but which face your die shows is secondary, the important thing is where it hits the target after bouncing of the table at least once – luck takes a back seat here, you fight monsters with dexterity. In every room you enter, you encounter one monster, and combat basically always goes the same: you throw the dice, and if you hit the target you do damage to the monster. If you miss, the monster damages you. Innovative, sure, but nothing to make it special in the long run yet. But to add spice, some monsters require you to roll in a specific way, as do some rooms and some weapons you can buy in the shop at the end of every dungeon level. And that adds buckets of spice, because suddenly you throw the die backwards, from one step away from the table, sitting under the table or by dropping it from your elbow. Or maybe all of the above, if you really need the bonus damage from your weapons. That’s the point where Dungeon Fighter turns into an instant classic in my eyes, I can’t remember when was the last time I laughed as hard at a game as when I was sitting under the table backwards and trying to flick a dice from a card to hit the target. If it looks like the dark side has an advantage over you so far, that’s by design – Dungeon Fighter gets easier with practice, but unless you play at the lowest level of difficulty it remains challenging. Still, a bit of evening the odds is in order. 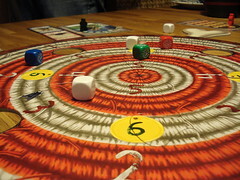 All the player characters – that you chose any which way before the game starts – has three special abilities, each tied to one colour of dice. When you roll that dice and it comes up with an eye symbol, about 50% of the time, the ability activates. Abilities include a lot of things: Torm the Babarian simply hits harder, cleric Sir Moo heals the party and Brockenstock the dwarf steals gold from monsters, just to give a few examples. New players will be especially happy about the various abilities that let you reroll the die. Choosing a die also involves some strategy because, once a die is used, it stays used. The next player has to use one of the remaining dice, and all the extra gold you just stole doesn’t help you when that die could have healed the dying party instead. Even worse things happen when you don’t kill the monster with the three coloured dice; now you have to either use the precious white dice from the heroes’ treasury or let the whole party take damage to get the coloured dice back. It’s not usually an easy decision. You really want to keep the white dice for the boss fight, but if your party takes too much damage some heroes might faint and only come back after the current fight and with three points of health and one special ability permanently gone. Torm Strong. Torm make dead. If, however, by some stroke of luck, you do defeat the monster, glory, fame and, above all, gold are yours. You also receive a white die for every coloured die you didn’t use. 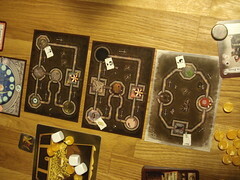 Those white die are essential to defeating the dungeon’s boss; in the boss fight, you cannot chose to take damage and get your coloured dice back. Once they are over you can use the white ones from the treasury, and when those are all gone the boss won. 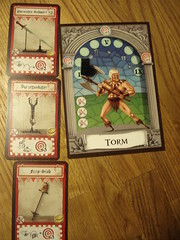 While there are many monsters and weapons with different wacky ways to roll the dice, Dungeon Fighter includes only four dungeon bosses that have more health and hit harder than the average monster, but they don’t have any special abilities that you didn’t see somewhere else before and thus feel a bit bland compared to the rest of the game. But like everything else, the bosses are printed on standard cards and I would be very surprised if there wasn’t an expansion for Dungeon Fighter in the making already that adds more cards to all the stacks. Dungeon Fighter hasn’t invented the sub-genre of dexterity-based dungeon crawlers – Catacombs did that last year by flicking wooden discs at monsters – but it adds a fresh entry with entirely new ideas and more wackyness than you see in most games. We all found it hilarious and it’s sure to get a lot of table time in the near future. If you’re not against humour in your games, this is one that you simply have to try. The sheer absurdity of the action around the table ensures that you will remember playing Dungeon Fighter. Now the project for next summer: make a giant target in the park and play outdoors with those big foamy dice you get as kid’s toys.